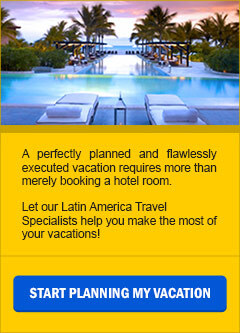 With more than 40 years of experience in the Latin America Vacation Programs we certainly are specialists. While other companies promote and sell every destination in the world, we concentrate our efforts in a small area where we know first-hand what works best for our valued guests, always providing exceptional worry-free, valued priced vacation experiences. Are the EcoAmerica Tours departures guaranteed? Absolutely! Regardless the number of passengers in a party, all the programmed departures for each one of the EcoAmerica Tours are guaranteed. The most significative difference you may experience is the size of the vehicle; beyond that, all the programmed activities will be delivered as specified in the itinerary. Of course, space is subject to availability at booking time. Early reservations are recommended. Are the EcoAmerica Tours fully escorted? Yes and no. While sightseeing and partaking in the included features, local certified English-speaking guides manage all the details, and they are pleased to share with you fascinating stories about their country. Prior to your departure from your home city, we will email you a complete and fully detailed itinerary with the phone numbers of our local partners, including access to in-country Emergency Help Line(s). While spending time at leisure, particularly the time when you are supposed to enjoy and relax, there will not be a guide around to disturb you. What does the EcoAmerica Tours price include? Almost everything! Each and every one of the EcoAmerica Tours include hotel, lodge and/or cruise ship accommodations, meals as listed in each itinerary, all the land and boat transfers, excursions, attractions and entrance fees (where applicable), as specified in the itineraries. While at the All Inclusive Beach Resort in Costa Rica, all the beverages (alcoholic and non-alcoholic national brands) are included as well. What is not included in the EcoAmerica Tours price? The price for any of the EcoAmerica Tours does not include international airfares and/or airfares within selected destination(s), except for Belize program where round trip airfare is included from Belize City to Ambergris Caye Island, country and/or airport(s) entry or departure fees and/or taxes, visas, phone calls, laundry, personal expenses, food or beverages not on the regular menu and/or not included in the tour, tips for guides and drivers. Hotel meals are not guide-assisted. Applicable tour taxes and service fees listed in every tour’s price section. Are the EcoAmerica Tours suitable for all ages? Yes and no. Along our many years of experience, we have noticed that structured vacations, such as locally hosted tours, may not be fully enjoyed by children younger than 11 years old. For an ideal, customized family vacation, we suggest you contact us dirrectly for assistance. Are the EcoAmerica Tours suitable for single travelers? One of the advantages of these tours is the camaraderie. Group sightseeing and evening social gatherings make it easy for single travelers to meet and mingle with fellow passengers while enjoying a safe, secure and worry-free environment. Nevertheless, and as a result of our many years of experience, we don’t offer to match any passenger with a roommate. Are the EcoAmerica Tours suitable for travelers who need special assistance? Structured vacations, such as these tours, may not be fully enjoyed by travelers who need special assistance. For an ideal, customized program, we suggest you to contact us dirrectly for assistance.